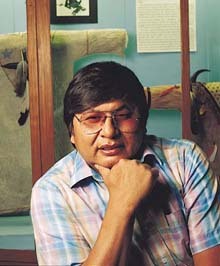 The audio file attached below presents part of an interview with Ben Black Bear Jr. from the Sičháŋǧu Oyáte (Rosebud Reservation). In this part of the interview he gives his assessment of the New Lakota Dictionary and his perspective on the standard orthography. Ben Black Bear Jr. is a fluent native speaker of Lakota, former chair of the Lakota language department at Siŋté Glešká College, comes from one of the most traditional families in Rosebud and has been involved with various aspects of the Lakota language for four decades. In the following part of the interview Ben Black Bear Jr. talks about his experience with teaching at the Lakȟól’iyapi Summer Institute (organized by the Lakota Language Consortium and the Sitting Bull College) and also about some memories of his father, a renowned traditional Lakota singer and dancer. Thanks for posting these interviews. I agree with Mr. Black Bear that it's important to have a unified way of writing the Lakȟóta language. I like the way the NLD has the accent on the vowels to help with stress and using the Lakȟóta alphabet with letters like š,ž,ǧ,ȟ. This helps me to pronounce the words the way they should be pronounced. Mr. Black Bear speaks very well and gets his message across very well. Tȟuŋkášilayapi tȟawápaha kiŋháŋ owíhaŋkešniyaŋ hé nážiŋ kte kštó. Donation Confirmation # is 841269. Cousin Nancy, your comment about hoping that other Native language programs are emulating LLC reminded me of just how precious the LLC and this on-line forum are. I looked around for a long time, and as far as I can tell no other language program on the US mainland is even remotely close to this one. The Hawaiians are doing a lot and making progress, but their political and cultural situation is somewhat different. Recently an Arapahoe immersion school opened in Wyoming, but with only 24 pupils and little technical or financial support they have a tough row to hoe. However, immersion will doubtless show significant results if they can keep their doors open. So I strongly agree with you that it would be great if every Native language program would use the LLC as a model, at least if they couldn't go the immersion route. Thanks Ji. I hope too other Native languages follow the example of the LLC. It's a good way for people to learn the language. Very interesting. I struggle with this new phoentic writing system because I've been used to other ways for over 40 years...but I'm trying!